Lovely shop on Regent Street selling bath stuff, etc. For some reason, the main part of the stock is downstairs; the ground floor part is very sparse and empty. Last visited by Kake, 17 July 2007. 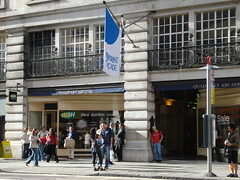 Opening times confirmed by telephone, 25 May 2007. Last edited 2008-03-18 14:58:18 (version 5; diff). List all versions. Page last edited 2008-03-18 14:58:18 (version 5).